For about 300 nights out of the year, Mauna Kea on the Big Island of Hawaii is one of the best places in the world for ground-based astronomy. At an elevation of 4,205 meters (13,796 ft), the summit sits above a large portion of the Earth’s atmosphere, and usually, the sky is clear, calm and dry. Indeed, 13 giant telescopes sit Mauna Kea’s summit, and they have made some of the biggest discoveries in astronomy. But for the remaining nights of the year, a variety of weather-related issues can keep astronomers from observing, and visitors from climbing to the summit to see those pristine skies for themselves, as well as being able to watch some of our biggest eyes on the skies action. Sometimes clouds, high winds or humidity might keep the telescope domes closed, other times snow can close the roads. On a recent visit to Hawaii, heavy snow kept the roads closed for three days and my long-planned trip to the top of Mauna Kea was, disappointingly, scrubbed. But I did get a great behind the scenes tour of the W. M. Keck Observatory headquarters in Waimea. The Keck Headquarters and visitor center in Waimea. But the domes on the telescope can’t be opened until the sun goes down. About 125 people work full-time at Keck, of which two-thirds are local people from from Hawaii. With an annual operating budget of $11 million, the Observatory is one of the town’s largest employers. Most astronomers have just two nights for observing, and Starr said it can be up to a year and a half from when astronomers submit a proposal to use the Keck telescopes to when they actually get to observe. But sometimes, depending on the astronomer and what they are observing, they’ll get to return again fairly quickly when the weather doesn’t allow for observing. “The past 2 nights we haven’t been observing, and those people are in town ready to go,” Starr said. The backside of facilities includes the observatory’s own mechanics shop. “We have eight 4-wheel drive automobiles to get to the summit, and our own mechanic shop to keep them all in top shape,” Starr said. The Keck Observatory’s headquarters in Waimea is open to visitors, and volunteer guides are available Tuesday through Friday from 10 a.m. to 2 p.m. to share information about Keck and the other Mauna Kea observatories. The visitor’s center also has a conference room for public lectures from visiting astronomers. The twin Keck telescopes are the world’s largest optical and infrared telescopes. Each telescope stands eight stories tall, weighs 300 tons and operates with nanometer precision. The telescopes’ primary mirrors are 10 meters in diameter and are each composed of 36 hexagonal segments that work in concert as a single piece of reflective glass. Outside in the visitor center courtyard is a grassy area that represents the size of just one of the hexagonal segments, which are 1.8 meters (6 ft) in diameter. Each segment weighs .5 metric tons (880 pounds), and are three inches thick. They are made of a glass and ceramic composite called Zerodur. Zerodur itself is not reflective, so they are covered with a thin reflective layer of aluminum. “While the telescope is actually working it is constantly fine tuning the position of the individual mirrors to make sure they are all in alignment,” said our tour guide Rosalind Redfield. On the telescope, each segment’s figure is kept stable by a system of extremely rigid support structures and adjustable warping harnesses. During observing, a computer-controlled system of sensors and actuators adjusts the position of each segment – relative to the neighboring segment – to an accuracy of four nanometers, about the size of a few molecules, or about 1/25,000 the diameter of a human hair. This twice-per-second adjustment effectively counters the tug of gravity. Mauna Kea summit as seen from the northeast. Credit: University of Hawaii. The two Keck telescopes and the 8.3 meter Subaru telescopes take the very top of the mountain. They are joined by the 8.1 Gemini North Telescope , the 0.6-m educational telescope, from the University of Hawaii at Hilo, a 2.2-m telescope University of Hawaii Institute for Astronomy, the 3 meter NASA Infrared Telescope Facility, the 3.6 meter Canada-France-Hawaii Telescope, the 3.8 meter UKIRT (United Kingdom Infrared Telescope), the 10.4 Caltech Submillimeter Observatory, the 15 meter James Clerk Maxwell Telescope, the 8X6 meter Submillimeter Array and the 25 meter Very Long Baseline Array. A map of the telescopes on Mauna Kea. Credit: University of Hawaii. But, no climb to the summit for me — not this time anyway! I hope to return one day to Mauna Kea to see first-hand where science and nature come together to allow for continued discovery of our universe. Clouds and snow obscure the summit of Mauna Kea as I drive away, after a climb to visit the Keck telescopes was nixed. Image: Nancy Atkinson. For more information about the Keck Observatory, see their website, and if you are in Hawaii or going to be visiting the Big Island, find information here on how you can visit the Observatory headquarters, or go to the summit. An enticing new extrasolar planet found using the Keck Observatory in Hawaii is just three times the mass of Earth and it orbits the parent star squarely in the middle of the star’s “Goldilocks zone,” a potential habitable region where liquid water could exist on the planet’s surface. If confirmed, this would be the most Earth-like exoplanet yet discovered and the first strong case for a potentially habitable one. The discoverers also say this finding could mean our galaxy may be teeming with prospective habitable planets. The most interesting of the two new planets is Gliese 581g, with a mass three to four times that of the Earth and an orbital period of just under 37 days. Its mass indicates that it is probably a rocky planet with likely enough gravity to hold on to an atmosphere. The planet is also tidally locked to the star, meaning that one side is always facing the star in sunlight, while the side facing away from the star is in perpetual darkness. One effect of this is to stabilize the planet’s surface climates, according to Vogt. The most habitable zone on the planet’s surface would be on the terminator, the line between shadow and light, with surface temperatures decreasing toward the dark side and increasing toward the light side. There has been debate about the other planets found previously around Gliese 581, whether they could be habitable or not. Two of them lie at the edges of the habitable zone, one on the hot side (planet c) and one on the cold side (planet d). While some astronomers still think planet d may be habitable if it has a thick atmosphere with a strong greenhouse effect to warm it up, others are skeptical. The newly discovered planet g, however, lies right in the middle of the habitable zone. “We had planets on both sides of the habitable zone–one too hot and one too cold–and now we have one in the middle that’s just right,” Vogt said. If Gliese 581g has a rocky composition similar to the Earth’s, its diameter would be about 1.2 to 1.4 times that of the Earth. The surface gravity would be about the same or slightly higher than Earth’s, so that a person could easily walk upright on the planet, Vogt said. The planet was found using the HIRES spectrometer (designed by Vogt) on the Keck I Telescope, measuring the star’s radial velocity. The gravitational tug of an orbiting planet causes periodic changes in the radial velocity of the host star. 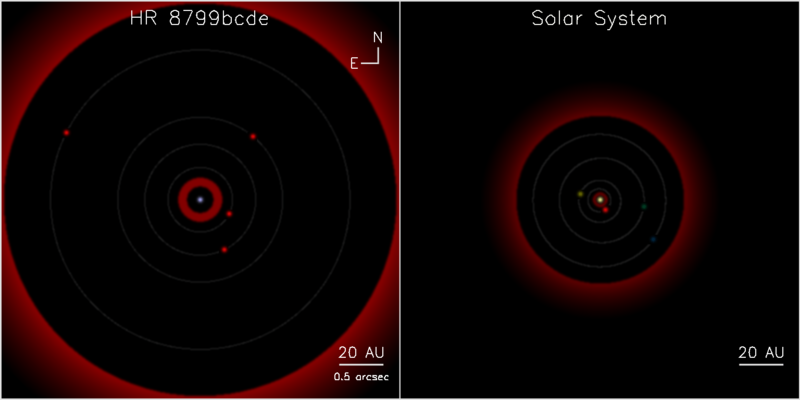 Multiple planets induce complex wobbles in the star’s motion, and astronomers use sophisticated analyses to detect planets and determine their orbits and masses. In addition to the radial velocity observations, coauthors Henry and Williamson made precise night-to-night brightness measurements of the star with one of Tennessee State University’s robotic telescopes. “Our brightness measurements verify that the radial velocity variations are caused by the new orbiting planet and not by any process within the star itself,” Henry said. Here’s an article about abiogenesis, or the beginning of life on Earth.